Author(s): Gabriela Nestal de Moraes, Laura Bella, Stefania Zona, Matthew J. Burton, Eric W.-F. Lam. Department of Surgery and Cancer, Imperial College London, Hammersmith Hospital Campus, Du Cane Road, London, W12 0NN, UK. FOXO3a and FOXM1 are two forkhead transcription factors with antagonistic roles in cancer and DNA damage response. FOXO3a functions like a typical tumour suppressor, whereas FOXM1 is a potent oncogene aberrantly overexpressed in genotoxic resistant cancers. FOXO3a not only represses FOXM1 expression but also its transcriptional output. Recent research has provided novel insights into a central role for FOXO3a and FOXM1 in DNA damage response. The FOXO3a-FOXM1 axis plays a pivotal role in DNA damage repair and the accompanied cellular response through regulating the expression of genes essential for DNA damage sensing, mediating, signalling and repair as well as for senescence, cell cycle and cell death control. In this manner, the FOXO3a-FOXM1 axis also holds the key to cell fate decision in response to genotoxic therapeutic agents and controls the equilibrium between DNA repair and cell termination by cell death or senescence. 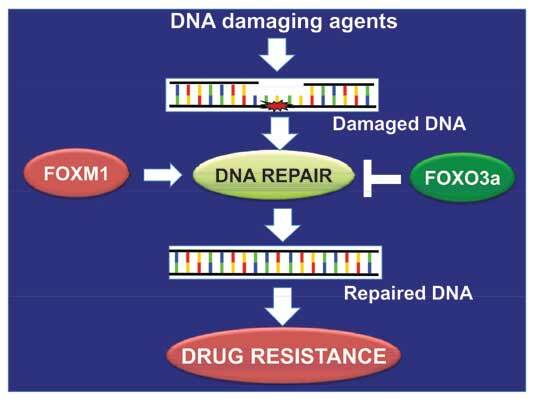 As a consequence, inhibition of FOXM1 or reactivation of FOXO3a in cancer cells could enhance the efficacy of DNA damaging cancer therapies by decreasing the rate of DNA repair and cell survival while increasing senescence and cell death. Conceptually, targeting FOXO3a and FOXM1 may represent a promising molecular therapeutic option for improving the efficacy and selectivity of DNA damage agents, particularly in genotoxic agent resistant cancer. In addition, FOXO3a, FOXM1 and their downstream transcriptional targets may also be reliable diagnostic biomarkers for predicting outcome, for selecting therapeutic options, and for monitoring treatments in DNA-damaging agent therapy. Keywords: Cancer, DNA damage, drug resistance, FOXM1, FOXO3a, genotoxic agents, transcriptional targets. Affiliation:Department of Surgery and Cancer, Imperial College London, Hammersmith Hospital Campus, Du Cane Road, London, W12 0NN, UK. Keywords:Cancer, DNA damage, drug resistance, FOXM1, FOXO3a, genotoxic agents, transcriptional targets. Abstract:FOXO3a and FOXM1 are two forkhead transcription factors with antagonistic roles in cancer and DNA damage response. FOXO3a functions like a typical tumour suppressor, whereas FOXM1 is a potent oncogene aberrantly overexpressed in genotoxic resistant cancers. FOXO3a not only represses FOXM1 expression but also its transcriptional output. Recent research has provided novel insights into a central role for FOXO3a and FOXM1 in DNA damage response. The FOXO3a-FOXM1 axis plays a pivotal role in DNA damage repair and the accompanied cellular response through regulating the expression of genes essential for DNA damage sensing, mediating, signalling and repair as well as for senescence, cell cycle and cell death control. In this manner, the FOXO3a-FOXM1 axis also holds the key to cell fate decision in response to genotoxic therapeutic agents and controls the equilibrium between DNA repair and cell termination by cell death or senescence. As a consequence, inhibition of FOXM1 or reactivation of FOXO3a in cancer cells could enhance the efficacy of DNA damaging cancer therapies by decreasing the rate of DNA repair and cell survival while increasing senescence and cell death. Conceptually, targeting FOXO3a and FOXM1 may represent a promising molecular therapeutic option for improving the efficacy and selectivity of DNA damage agents, particularly in genotoxic agent resistant cancer. In addition, FOXO3a, FOXM1 and their downstream transcriptional targets may also be reliable diagnostic biomarkers for predicting outcome, for selecting therapeutic options, and for monitoring treatments in DNA-damaging agent therapy.